As I ponder my kitchen, which is a total wreck, I see an opportunity to prepare something delicious. Even though I have no sink, or countertops, or anything, I do have the chance to make some cheese. If you can make something while remodeling your kitchen, then you know it’s easy to do! If you are lucky enough to own a dairy animal and do your own home-milking, then you probably have excess milk on your hands and wonder, “What could I do with this extra milk?” Extra milk can be processed into delicious cheeses. It is fun, easy, and doesn’t require a lot of expensive equipment to get started. As you will see, you don’t even need a kitchen, although I do highly recommend one. You can also use store-bought milk for the cheese I am making today, fromage blanc. To get started, you need a dairy thermometer, a starter culture, some rennet, a colander, slotted spoon and a stainless steel or granite-ware pot. 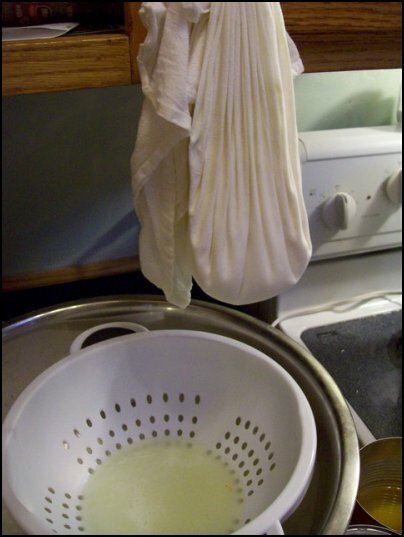 A clean flour sack towel bought locally will do for straining your curds, and in just a few hours you can be in artisan-cheese heaven. Your spouse will be amazed, and your friends will suddenly return all your calls. Even your family will start to think you are a pretty darned handy person to have around. Christmas and Thanksgiving will be joyous events where everyone likes YOU best because of the fantastic cheese you bring. But before you enter into dairy bliss, there may be some strange terms in there. Curds, culture, rennet, and molds may seem like unsavory things to be avoided, but in fact these are the things from which cheese is made. Cheese is actually a living organism that continues to grow and change as it ages. 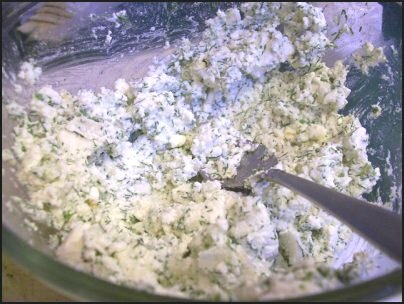 There are delightfully easy soft cheeses, such as fromage blanc, to terribly complex mold cheeses such as the blue cheeses, like Gorgonzola. But, all of these beautiful and nutritious cheeses can be made at home, and with some practice and patience you can make that perishable milk into a cheese that will keep and age for many, many months. What better way to make an occasion special than to bring out a wheel of Gouda that has been aging? A culture is needed to ripen the flavor and establish the correct bacteria to turn milk into cheese. These bacteria make the flavor, the slightly tangy, sour, or sharp flavors you are accustomed to when you taste cheese. There are two types of culture commonly used in cheese making, mesophilic and thermophilic. Before your eyes cross, relax, they are the same as cultured buttermilk and yogurt. Buttermilk, or mesophilic cultures react well to low temperatures and are best suited to cheeses such as Monterrey Jack, fromage blanc, and many, many more. Thermophilic cultures are better suited to cheeses that you want to heat up a little more, like cheddars and many others. The bottom line is that you need a culture to make a cheese of any kind. Today, I am using a mesophilic, or buttermilk culture. This can usually be bought in the dairy section in the store. Be sneaky about it, and get the carton from the very back, it will be fresher. Getting a culture is easy as they are readably available in many local groceries. There are several types of cheese that the home-cheese-maker can make. Yogurts, soft cheeses and even pressed cheeses such as Monterrey Jack are good cheeses that you can make yourself after just a bit of practice. You do not need an expensive cheese press; in fact you can make a press, or just press the cheese in a cloth. All of these cheeses use this same culture, but you need more than the culture to make cheese. You also need rennet. Rennet is an animal product derived from calves’ stomachs. You can get Junket brand tablets at your local store, or if you do not eat this kind of animal product, you can purchase vegetarian rennet from a cheese supply store. With one culture and some rennet, you can make several types of cheeses. 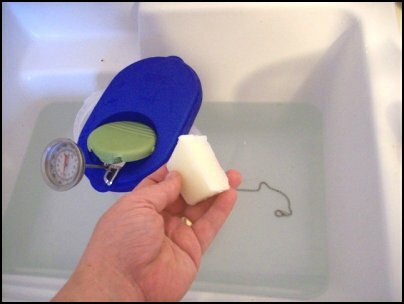 Dairy thermometers are inexpensive and easy to order online, but you may have trouble finding one in a local store. Gourmet shops, kitchen supply stores, brewery supply and farm stores are a good place to look, but ordering will be easier, and with the price of gas for many rural people, cheaper as well. They range in price from $6 to $20 and come in a variety of types. The dial type is a good one, inexpensive and easy to use, mine was $9.95. You need to be able to tell the temperatures of the milk very precisely and in a very wide temperature range, so a dairy thermometer is essential. Dairy thermometers are inexpensive and easy to order online, but you may have trouble finding one in a local store. Gourmet shops, kitchen supply stores, brewery supply, and farm stores are a good place to look, but ordering will be easier, and with the price of gas for many rural people, cheaper as well. They range in price from $6 to $20 and come in a variety of types. The dial type is a good one, inexpensive and easy to use, mine was $9.95. You need to be able to tell the temperatures of the milk very precisely and in a very wide temperature range, so a dairy thermometer is essential. If you’ve got fresh milk, then it is advisable to pasteurize it, because it eliminates any bacteria present in the milk, and enables the bacteria being introduced to flourish, and give you the best flavor. Most cheeses will be more consistent if you pasteurize, but you can also use raw milk, if you desire. Be aware that there could be unhealthy bacteria present and that it could cause sickness, or a bad flavor. To pasteurize, you need to put your raw milk into a clean stainless steel or granite-ware pot. If you use granite, be sure there are no chips in it, or rusted spots. These can be bought for very little locally, and most people have one or two around. You can use a 1.5 gallon pot, or process it in smaller batches. Place a skillet on the stove with an inch of water in it. Place your pan of milk inside this, or use a double boiler. Turn your heat on medium high or so and put your thermometer in the milk. Heat the milk, and stir it regularly, until it reaches 160 degrees. Let the milk sit at this temperature for 15 seconds, and then put the pan in ice water to chill. It is the wise cheese maker that puts the colander, cloth and spoon in a big pan with some water and steam sterilizes it. You can use bleach or a sanitizer, but beware: if you leave any residue on the materials, it will KILL your cheese, which needs the bacteria to flourish. So rinse very, very well if you use these products to clean utensils. Everything you will use for the cheese should be as close to sterile as possible. Otherwise your cheese may not have a good flavor, or worse could make you sick. Use steam, the dishwasher (heated dry cycle) or a sanitizer. 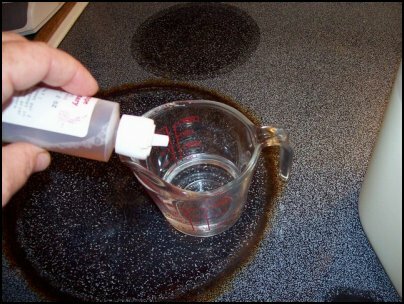 You will need to sterilize your main pan or pitcher, a spoon, your cloth, and a colander. I put the pitcher in the dishwasher, and then steam all the other utensils. Regardless, be sure everything that touches your cheese, including your hands is meticulously clean. Right after pasteurizing is a great time to make your cheese, because you can cool the milk down to the target temperature of 86 degrees. If you are using store milk, you should warm it up to 86 degrees. Store milk may require some calcium chloride but for soft cheeses, most milk will work fine. When you order a thermometer, go ahead an order some calcium chloride if you plan on using store milk or goat’s milk. Sometimes these two types of milk just need a boost turn out right. We have never needed it, but some goat owners have, because the calcium content can vary from animal to animal. If you are warming your milk, put it in a very clean plastic pitcher, or a deep pan, and place it in hot water to warm slowly. Put your thermometer in and give it a stir every few minutes to avoid over-heating it. Once it reaches 86 degrees you can remove it from the hot water and add your culture. You will want to add about 2 ounces of buttermilk for each gallon of milk. I open the carton of buttermilk, and immediately pour it into ice cube trays and freeze them. Standard ice cube trays are one ounce cubes. Then you can just thaw out the desired number and add them to your milk. For one gallon of milk to make the fromage blanc, I add two cubes of buttermilk, and warm it all up to 86 degrees. If you use a powdered culture, then stir it in, following the directions. Usually you dissolve it in water, and then add it to the warmed milk. The package will tell you how much per gallon. Now you can be lazy for an hour or so and just relax and let the culture ripen. You do need to make sure the milk stays warm, and I usually will put it back in the bath if it gets under 80 degrees. It won’t fall under 80 degrees at a room temperature of 72. Once your milk has ripened, it is time to add the rennet which causes it to form curds. The culture flavors the milk, and the rennet will coagulate the milk to form curds. So, either crush 1/4 rennet tablet and dissolve in 1/4 c cool water, or dilute your liquid rennet in 1/4 c cool water. Now you get to be lazy again, and I get to go work on rebuilding those cabinets I tore out. If you don’t get a clean break, leave it to sit a while longer, and check again. If you still do not get a clean break, then you may have needed to add some calcium chloride, this may especially be true if you use goat milk or store milk. I have never needed it for fromage blanc, but I have heard of people who did. Another reason is that you may have it in a spot that is too cool. Is the temperature still around 70 – 80 degrees or so? If not, you can try placing it in a warmer spot. Finally, if your rennet is old, or bad, then you could have a failed attempt. You will have to try again if you don’t have a clean break in 12 hours. It can take that long, but usually I can get one in 45 minutes. Once you have a clean break, you need to lay your clean flour sack towel over a clean colander and then I just dump all the curds in there, letting the liquid flow down the drain. Some more refined cheese makers, who have more finesse, gently ladle them in, but I don’t notice a difference in the product for fromage blanc, so I just dump them in. Now, gather the corners up, and hang it somewhere so that the liquid can drain out. The liquid part is whey and you can reserve it to make ricotta cheese, or it is an excellent animal feed for hogs, chickens, cats, or calves. Just place a bowl under the bag of cheese to catch your whey. Now, after all that work, you get to go relax again, I mean did you ever have such a relaxing and fun hobby before? Half the time involved could be quality time with a cold drink and a good book, and I don’t know about you, but it doesn’t get better than that. Yes, or building cupboards, but remodeling the kitchen isn’t nearly as fun, and I’m only doing it because I can’t stand the mess anymore. The point is, that even someone busy, or feeling tired can make cheese. perfect for crackers and breads as a spreadable cheese. You can add dill, garlic, salt, and pepper to taste. I particularly enjoy it on saltines, served with Kipper snacks, a phenomenon that hasn’t exactly caught on here in the Midwest but is available and delicious anyway. Look for these with the tuna in the grocery store. They are a lightly smoked, boneless fish fillet canned and ready to eat. Once your cheese has drained, it will look dry and crumbly to the touch and now it is time to season it. Here are two recipes I have made and enjoyed, one sweet and one savory. As the French would say, Bon Appetite! Use this nice spread on toasted bagels, slices of cake, pancakes or any number of things. Or, you can eat it with a spoon when nobody is looking…. 1/2 teaspoon un-iodized salt, sea salt, or cheese salt. Blend together and chill. Get inventive and have fun, add raisins, dried apples, or anything that sounds good, it probably will be. It would be great spread on some Whole-wheat Irish Soda Bread. 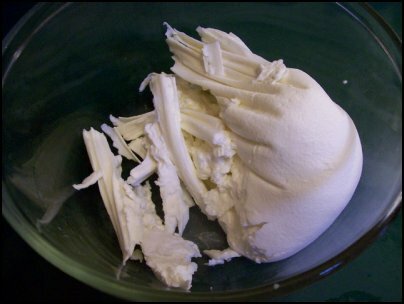 This is my favorite way to prepare fromage blanc. 2 or 3 crushed garlic cloves, or 1/2 to 1 teaspoon garlic paste. 1/2 – 1 teaspoon un-iodized salt, sea salt, or cheese salt. Helpful hints, buy fresh dill, and mince a bit at a time and add it, until it tastes like there is almost enough. As the cheese sits, the flavor will develop. You may put it in a cup, or cheese mold, or eat as is. You could even put a dollop on top of some Potato Corn Chowder. 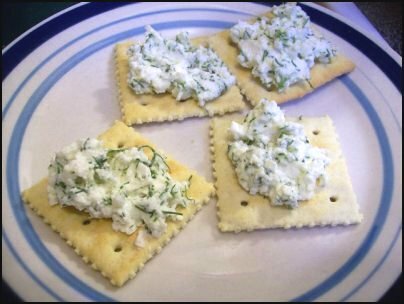 Buy the fromage blanc packets from Amazon or www.cheesemaking.com it is all in one, super easy and super affordable. Get a cheap wood burner and burn holes in food grade plastic, like yogurt cups, butter tubs and more to make nicely shaped cheeses. Use the freshest milk you can get, sneak them from the back of the cooler if you buy the milk. If you use buttermilk, take your last two cubes of frozen buttermilk and put it in a sterile pint jar, top it off with milk and let it sit around at room temp for 24 hours, and now you have a whole new batch to freeze for more cheese or baking! I have ordered from both these companies, and had a very positive experience. Cheese making has easy packets with rennet and culture all in one. They both have kits and various supplies and equipment at good prices. I have read tutorials and learned from all of these places and also had a good experience there as well. Good luck to you!